Games ranging from fantasy adventures to intense shooters have been tempting fans at the E3 games expo in Los Angeles. Nintendo fans rejoiced when the Japanese games giant showed off the latest Zelda title. It will come in two versions, one for the GameCube and one for the new Wii console. The Wii version makes uses of its unconventional motion-sensing controller. At the Nintendo stand, devotees queued for hours to get a first taste of Twilight Princess. The lucky few were able to wave the controller in the air for a touch of swordplay; or try their hand at fishing by flicking the control to cast the line. Zelda is a key title for Nintendo and will be one of the launch titles for the Wii. Microsoft made a big noise with its bloody Gears of War third-person shooter, due out later this year. The game boasts photo-realistic graphics as the developers have tried to make it look and feel like an action movie. The game pits humans against a race called the Locust Horde which has emerged from the bowels of the Earth. It is firmly aimed at gamers who like their firefights with a heavy dose of gore, but tries to avoid being a mindless shooter. One of the most promising playable PlayStation 3 games at E3 was Heavenly Sword, a third-person title with a red-haired beauty at the centre of the action. 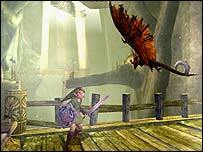 The fluid and detailed visuals of the game were impressive, as the heroine of the game battled wave after wave of enemies in an arena. The makers are striving to create a game high on drama and emotion, but which is also exciting to play. Heavenly Sword is a flagship title for Sony and is due out around the time of the launch of the PlayStation 3. 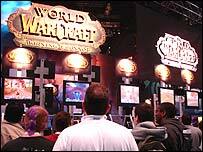 One of the busiest stands belonged to Blizzard, makers of the phenomenally successful World of Warcraft. The massive multiplayer online game now has some six million subscribers worldwide. At E3, attendees were able to get their hands on a major expansion of the game, called The Burning Crusade, due out later this year. Among the surprises for fans were details of a new species called the Draenei, descendents of a fierce, demonic race. It was nowhere to be seen on the show floor and it is not out until 2007; but an epic trailer for the new Halo game produced a big buzz among fans. 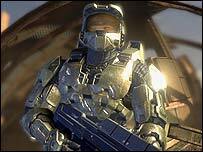 Halo 3 is the final instalment in the best-selling series. It was formally announced by Microsoft at its pre-E3 news conference, where the trailer was first played. It showed the hero of the game, Master Chief, back on Earth as alien Covenant forces battle humans for control of the planet. 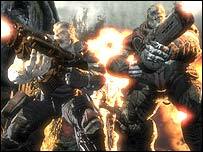 The cinematics have impressed fans, especially since the trailer was generated within the game.